Swimming is such an important skill for children to learn. I took swimming lessons as a child and made it as far as Bronze Medallion at the age of 12. We had a pool in our backyard and were avid boaters so it was a must that my sisters and I learn to swim. Plus, we enjoyed it and it was the one sport I was actually any good at! I was really proud of my whipkick and could tread water like a boss. It’s no surprise that I signed both my daughters up for swimming lessons at a young age. Bridget is now in level seven and takes lessons at our local community swimming pool. She’s come a long way for a kid who started out being afraid of the water. Now she’s diving, doing her front and back crawls and becoming a stronger swimmer. I’m very proud of her and glad to see she is having fun with her lessons. 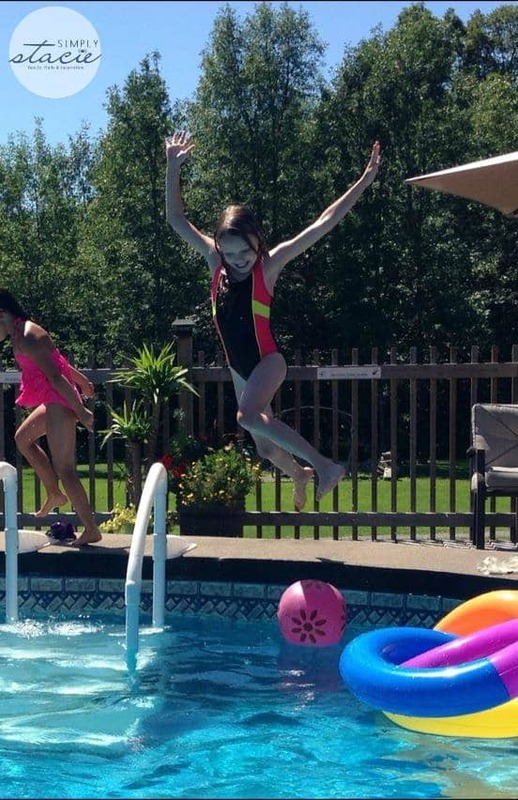 Did you know that Swimming Canada, the national governing body of competitive swimming, wants every Canadian child to learn to swim at least 25m on their own before completing elementary school? I fully support this initiative and all its important benefits. Learning to swim reduces the risk of drowning for a child and increases a child’s overall confidence fitness and health. Plus it opens up a whole new world of opportunities whether its competitive swimming or becoming a lifeguard. Visit Swimming Canada to learn more about swimming lessons for kids and how you can sign your child (or children) up for lessons. Chicken Farmers of Canada is a strong long-term supporter of Swimming Canada and they’ve come together to release a brand new digital cookbook called the Swim Kitchen Digital Cookbook! We all know that healthy eating is a crucial part of any training regimen and of living a balanced lifestyle. Canadian chicken is not only tasty, but it’s also an excellent source of lean protein. Look for the Raised by a Chicken Farmer logo when you are out doing your grocery shopping! Download the free Swim Kitchen Digital Cookbook today and try some of the delicious healthy recipes featured inside. 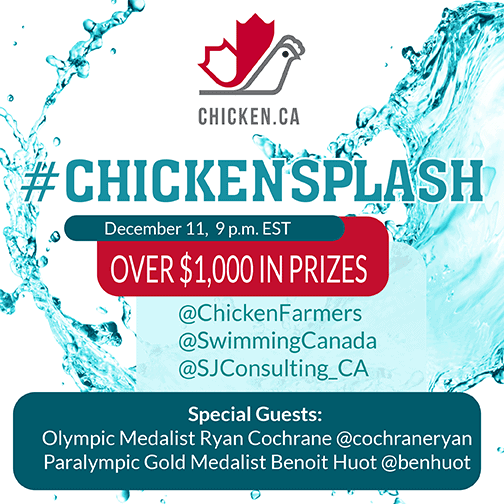 You are invited to the #ChickenSplash Twitter Party on December 11th at 9 pm EST! There will be a few special guests in attendance – Ryan Cochrane (two-time Olympic medallist and Canada’s distance swimming king) and Benoit Huot (Paralympic legend with 19 medals and Canada’s flag bearer in London in 2012). Don’t miss it! Prizes: Two $200 Sobey’s or Canada SafewayGift Cards, Two $100 Sobey’s or Canada Safeway Gift Cards, Two $50 Sobey’s or Canada Safeway Gift Cards, Three Speedo Backpack prize packs, One CFC prize pack (ARV $200) and more. I’ve never tried Canadian chicken before! We do love Sister Shubert’s though! Thanks for the freebie! We love chicken dinners in our home!! Swimming is so important for kids to learn! Great cause! I never know where I will be at a given day so hard to do the twitter parties, but good luck all! Swimming is important to learn. Even if they don’t want to later basic knowledge is needed. Our neighbor is afraid of the water and wanted her children to be strong swimmers since she didn’t feel able to save them. My daughter taught them lessons for a few years before they took an official year of diving. I have never heard of a swimmer’s cookbook but I know some of the professionals do have an interesting diet. Have to keep your strength up. Wish my parents had pushed me more into swimming lessons. Can’t wait for tonight’s party!